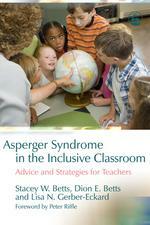 Offers support and practical techniques for teachers who work with children with Asperger Syndrome (AS). Based on the successful experiences of classroom teachers, and written from a teacher's perspective, this book provides creative and easy-to-apply strategies that support and encourage AS students in the mainstream classroom, from organization and time management techniques to framing classroom instructions to make lessons more accessible for children with AS. The advice relates to every part of the school day and includes advice for teaching specific subject areas. Gives tips on helping students navigate the school environment, how to handle social situations like lunch and breaks, and what to do during unstructured periods.